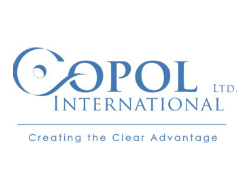 Copol International Ltd. is the leading North American manufacturer of Cast Polypropylene film for all applications, from food and produce packaging, medical applications, industrial products and many more. From mono-layers films to 5 layer structures to service all customers’ specialized requirements. At Copol, the company is all about servicing customers. Their dedicated team of skilled and experienced employees are committed to exceeding your expectations. For over 20 Years the focus has been on Cast Polypropylene film. Copol prides itself on being a North American producer able to supply any size order, big and small, directly to the customer’s door. Copol is committed to quality and focused on growth and innovation, helping customers grow their business. Creating the Clear Advantage is more than just a catchy slogan, it is fundamental to their business culture and values. Copol’s team welcomes the opportunity to work with customers to demonstrate first-hand how a relationship with Copol will provide a clear competitive advantage.